U.S. Attorney General Jeff Sessions recently directed the Justice Department to enforce a “zero tolerance policy” at the U.S.-Mexico border for cases of suspected illegal migration. This policy includes the practice of separating children from their parents during criminal prosecution proceedings. In the first two weeks of full implementation, Sessions’ policy had led to more than 650 children being taken from their parents and placed into federal detainment centers. Last Thursday, Sessions cited Romans 13 as justification for his immigration policies. Kingdom Mission Society responded with a statement calling this a misuse of Scripture and noting the Christian Responsibility to Protect. We are a society based on the rule of law. Under our laws and obligations, people have the right to seek asylum. The asylum court should be a fair and transparent process, and a better solution must be found that neither detains families for months at a time or separates those families from their children, unless there is a legal basis to do so. What we are seeing on the news today are signs of a broken system. The cost of this broken system is being borne by the most vulnerable in our midst: children. As people of faith, we can and must do better. The time for comprehensive immigration reform is now. Thou shalt neither vex a stranger or oppress him: for ye were strangers in the land of Egypt (Exodus 22:21). We’ve all had times in our lives where we felt out of place. Whether it was the first time we went to school or during a significant moment of loss. We know what it feels like to be in strange and unfamiliar circumstances. Now imagine you were a child, and your parent takes you on a journey to a new place far far away from home. Just as you think things will finally return to normal people you don’t know, in a language you don’t speak take your parents away. You would be traumatized. Now ask yourself how would Jesus want you to respond if you had a personal relationship with that child, if you were their neighbor or knew them through school. Words fail me. As an evangelical leader for over 40 years I’m astounded at how far off the tracks my movement has gone. Jesus said ‘suffer the little children to come unto me’ and ‘whatever you do to the least you do to me.’ We must speak up on behalf of these innocent victims against the injustices raining down on them. The latest round of immigration legislation proposals continues to trample the dignity and aspirations of immigrants in our country. From a Christian perspective, the issue is not about trade offs and political maneuvering. If our country is truly committed to the moral and ethical principles of our faith, the well being and the future of the immigrants in our midst must be the priority. When I was three years old, my father went the hospital. My family took me to my aunt’s house. I stood at the door and cried most of the time. I remember it as if it were yesterday. My Aunt tried to comfort me, play with me, and hug me. Still, the experience left a mark on me. As a nation, we are now creating an experience far, far worse for these children and far worse for their parents. It will leave a mark. But not just on them – it will leave a mark on us a nation. As our elected representatives, we will remember what you do, or do not do, to remedy this crisis of human rights. Use the power of your voice and your office to reunite these families. Act swiftly. With every breath the wounds grow deeper – both for these families and for the soul of America. 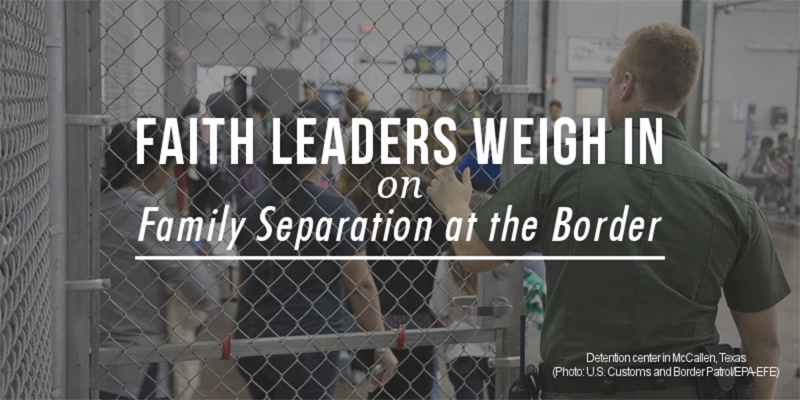 I join with many Christian leaders across a wide range of traditions to express my concern over the current administration’s separation of children from parents when they are detained crossing the border. Yesterday’s executive order was a very limited and temporary step, and Congress needs to make a concerted bipartisan effort to create a long-term solution. I also urge our political leaders to do the even harder work of engaging with and proposing solutions to the realities in Central America that are creating this crisis in the first place. As a decent nation, we have a duty, not only to accept those fleeing violence and extreme poverty, but to join with other nations in reducing the causes of violence and poverty in countries we and others have exploited for generations.